Mac owners who use Gmail know Apple's Mail app for OS X is less than perfect when it comes to pushing emails from Google's service. 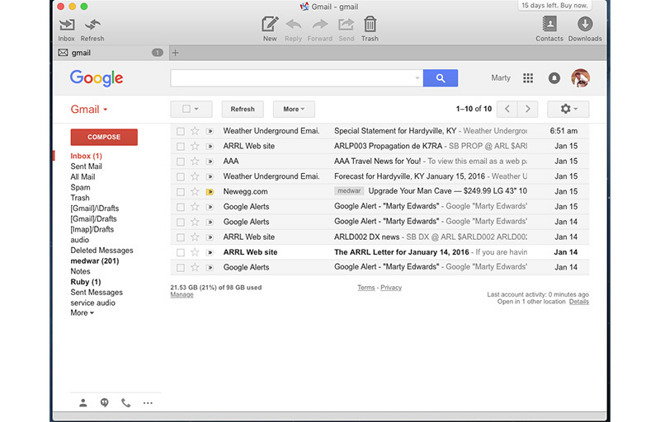 AppleInsider weeded through a forest of third party apps to find the fastest, cleanest and most reliable push Gmail clients for your desktop. Google's Gmail is one of the most popular email products around, and with generous storage allotments, reliable service and easy web or client integration, it's not difficult to see why. There is one negative, however, in that push email support for iOS and Mac is lacking. 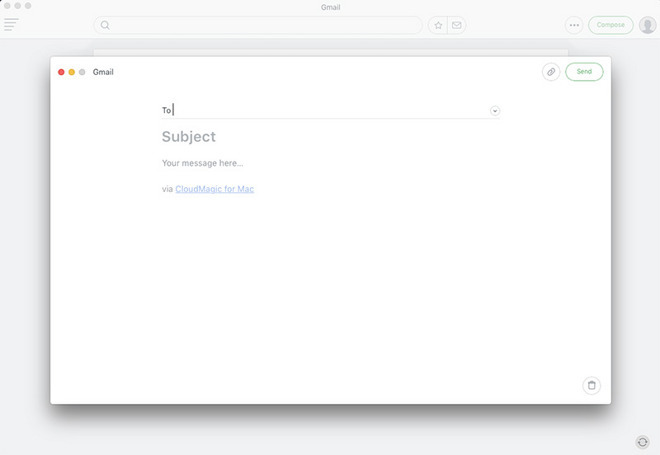 If you depend on Gmail and need instant access to your messages, you'll want to look beyond Apple's first-party offerings. In evaluating the following Mac applications, each was loaded one-by-one and tested by sending emails from a second Gmail account running in a Web browser on another computer. 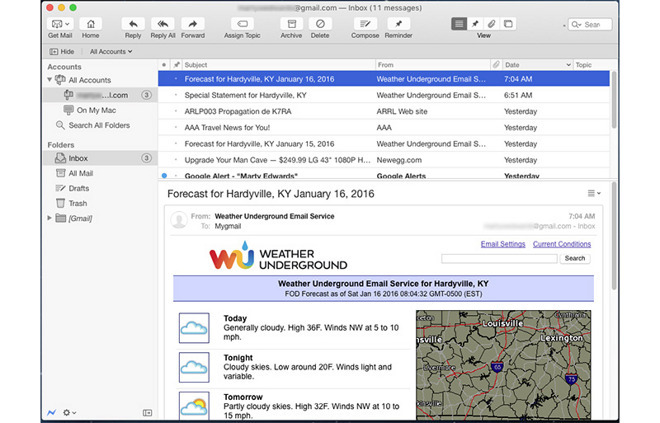 MailPlane offers the best OS X experience of any third party mail application. It's easy to configure, handles multiple accounts and was by far the quickest to push Gmail to the Mac. Testing from one account to another, MailPlane never once failed on a push operation. The interface is nearly identical to the Gmail Web interface, with the addition of some larger icons at the top for quick email composition, message management, access your contacts and more. Just above an integrated Google search bar are tabs for adding multiple Gmail accounts, as well as Gmail Calendar and Contacts. 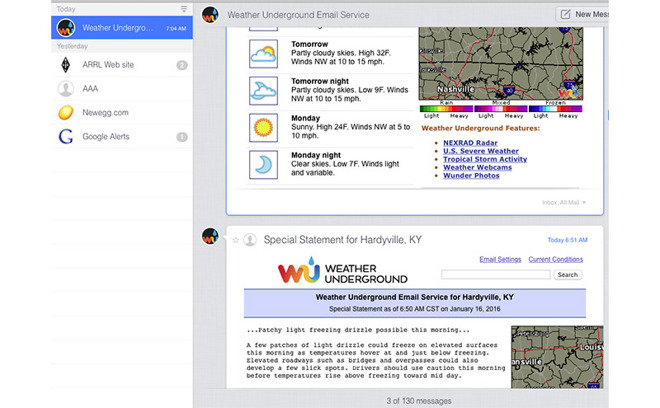 If you don't like Gmail's Web interface, you probably won't like MailPlane as it's basically an OS X-coded wrapper. However, that same interface makes MailPlane a familiar work environment, while feature additions make it much more functional and easy to use compared to the regular Web client. For example, I really liked the menu bar icon —a black M in the Mac menu bar that turns red when you have new mail. You can click on this M to get new mail, compose mail, or set do not disturb. When you select do not disturb, the M turns upside to look like a W.
MailPlane, according to the website has been around for 8.8 years and has had 156 updates. The app is available for a single user for $24.95 but can be installed on any Mac you personally use. There is a family license for up to five people in the same household for $39.95. MailPlane is not available on the Mac App Store but can be downloaded from the developer's website. There is a 15-day trial if you want to check it out first. 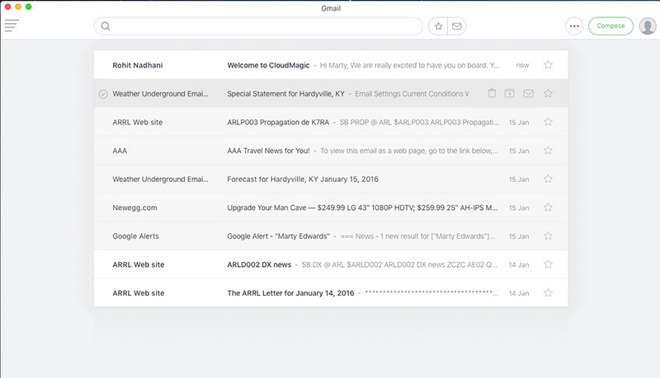 CouldMagic has fielded apps for iOS and Android for some time, and this month the company launched a version for OS X. CouldMagic is much more than a simple email app. It combines all your emails accounts into one app and synchronizes them across all devices on which you have the app installed whether iOS, Android or OS X. Setup with Gmail was quick and easy. After Gmail asked for the standard permissions, all my folders and gmail synced up automatically. You can also add Exchange, Yahoo, Outlook, iCloud and other IMAP email accounts. Google Apps are also supported. One feature I really enjoyed with the CloudMagic iPhone app is that you can select the options to show when you swipe from the lock screen. With Gmail's native app, I'm limited to read or archive (I prefer delete or archive, as many emails don't need to be saved). The iPhone app also lets you assign different tone alerts to each account helping you know which account received an email before you even look. You can set many preferences for each account such as signature and color, all of which syncs across devices. On the Mac —and iPhone —pushing of Gmails was practically instant most of the time. Any delays we experienced were a few seconds at most. You do not need to set up a CloudMagic account, but if you do, you obtain additional benefits. You can log into multiple devices and all your email account credentials will sync. Your preferences like signatures and account colors also sync and CloudMagic gives you the ability to remotely wipe data if you lose your phone or tablet. 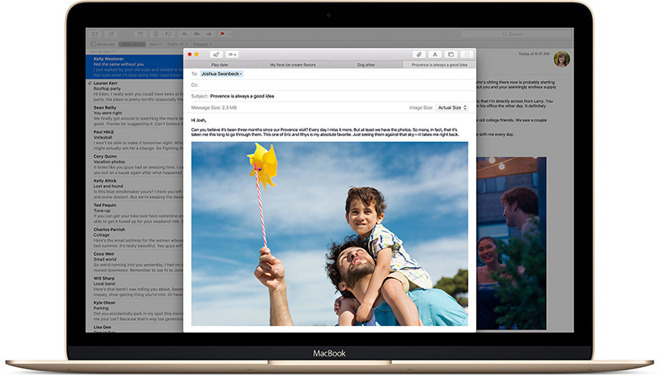 CloudMagic is a very powerful tool in simplifying email and making it "one" across all devices, whether it be Mac, iPhone or even Android hardware. If you primarily use just one email account such as Gmail, CloudMagic might be more than you need, but the extras —syncing signatures, look-up, remote data wiping —make the program well worth the price. I set up an Outlook account on my iPhone and in moments it was synchronized to my Mac desktop via "cloud magic." If you have many email accounts with many devices, CloudMagic is certainly worth a look. CloudMagic is not completely without issue, however. Because I run OS X in a slightly reduced resolution to better accommodate my eyes, the right side of the app always fell off the screen. Resizing the window was a no go, and enlarging it simply amplified the problem. I also use Windows machines quite often and CloudMagic is not yet available on Microsoft's platform. Some might be concerned having another cloud service accessing their email. If that is a concern, you can use the app(s) without creating a CloudMagic account. The company says this makes notifications less reliable and you are not able to sync preferences. CloudMagic is available on the Mac App Store for $19.99. Unibox is the cleanest looking of all the applications tested and certainly looked the most "Apple-like" in appearance, but not so in function. Setup of a 2-step verification Gmail account was very quick and easy, but an interface so clean and minimalist did add somewhat to the learning curve. Unibox approaches viewing your email quite differently. Even though the general look of Unibox was familiar, the way the application deals with email is quite different. On the left pane you have a list of contacts in the order you last communicated with them. The latest contact is always at the top and when you click on that contact, all their messages are on the right. It is a very interesting and fresh approach to viewing email, but after literally decades of viewing emails the "traditional" way I found the Unibox approach somewhat cumbersome at first. After a few hours, however, it became second nature to look for email by person and not by timeline. But, if you are switching from computer to computer or a device with a traditional email layout, coming back to Unibox will possibly be more confusing than helpful. A nice feature was that Unibox placed the logo of each company (when available) or Google portrait in the left column, which made finding email threads visually easy and fast. Unibox provides a view that shows all attachments exchanged with a particular contact. That was extremely useful for looking for an attachment from a client. Replies were simple without the formatting options of the other applications. The pushing of new gmail was quick but not nearly and instant as some of the other applications, but should be fast enough for day to day usage. Unibox is available on the Mac App store for $9.99, but you can download a 15-day trial from the the Unibox website. Postbox looks very much like the native OS X mail client. 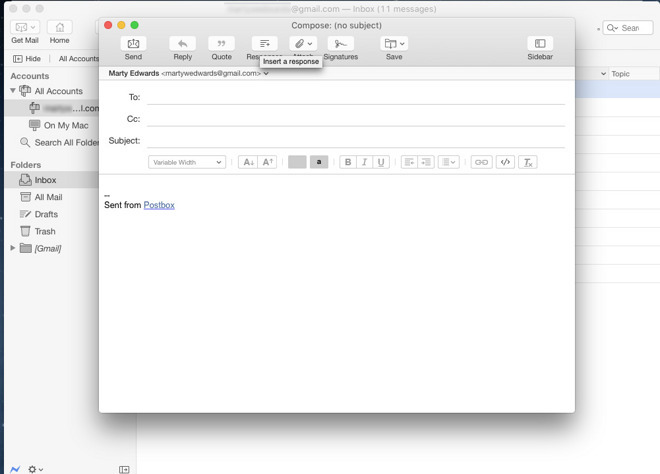 If you are used to Apple Mail on OS X, then Postbox will feel very familiar. Postbox offers many options such as vertical or horizontal layout with or without inline images. Postbox offers cloud file sharing where you can simply drop a file from Dropbox, OneDrive, or other cloud services into the body of a message and a link to that file is created automatically. You can streamline your replies by creating a set of pre-written responses such as for customer service or sales. The responses can include text, HTML, images, etc., which make it perfect to quickly respond with inquires for more information on products. When you reply you can choose from a drop menu and select the pre-written response you want or compose a new one at that time. This option, along with easy inclusion of cloud based files, make Postbox a very strong email client for businesses. One interesting option is that at the top bar there is a pushpin which is used to set reminders that stay at the top of your list of emails. One thing missing from Postbox is a menu bar notification icon but the taskbar icon does have a red badge indicating the number of unread mails in your inbox. The options in Postbox are numerous and there is somewhat of a learning curve, but it can handle emails well, push is basically instant and it's perfect for businesses with pre-written brochures to send to inquiring customers. Postbox was one of the quickest to push new Gmail, being bested only by MailPlane. Postbox is not available on the App Store but can purchased directly from the publisher for $15. There is a 30-day trial with a 60-day money back guarantee.